Gayatri Chakravorty Spivak, co-director of the CSSD project “The Rural Urban Interface: Gender and Poverty in Ghana and Kenya” and University Professor in the Humanities at Columbia University, was recently interviewed by the New York Times for an article on the nature of violence among marginalized people.“When one group designates another as lesser, they are saying the ‘inferior’ group cannot think in a ‘reasonable’ way,” said Spivak. “The oppressed, for their part, have been left with only one possible identity, which is one of violence. That becomes their politics and it appropriates their intellect,” she said. 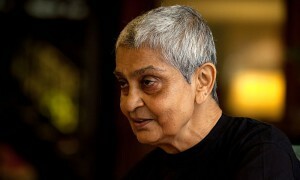 Dominating groups see the violence of the marginalized as “unreasonable” and demonize it, claimed Spivak, while state-legitimized violence is deemed “reasonable” as it flourishes among globalized systems of capitalism, legality, and philanthropy.